Welcome to the Paranormal & Ghost Society's PARANORMAL SUPER STORE a place where you can find some of the most sophisticated paranormal equipment on the net. Please feel free to browse our products by clicking the menu buttons above based on your categorial interest. 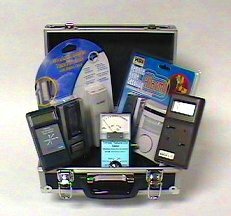 Our store carries everything from Motion Detectors, EMF & Gaussmeters, Books, Thermal Detectors/Imagers, Ionization Meters and other great essentials to suit all your paranormal needs. 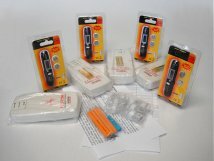 Products are reasonably priced and are shipped immediately upon placing your order. The PGS Superstore has been in business for over a decade providing the public with upstanding courteous service and a variety of great products. We guarantee top notch service for ALL professional and amateur paranormal investigators. Please feel free to browse our products as we GUARANTEE we have something for everyone! If you have any old or used gear you wish to donate to our society please feel free to contact us just as if you have any inquiries about the products we are supplying. Further information such as our policies are at the bottom of this page please look them over prior to your purchases we gladly take all forms of payment at your convenience. We also offer products in BULK quantity which could SAVE you 100s of dollars if not thousands email me for details. All products come with a 30 day return policy and we assure you service with the highest of integrity. 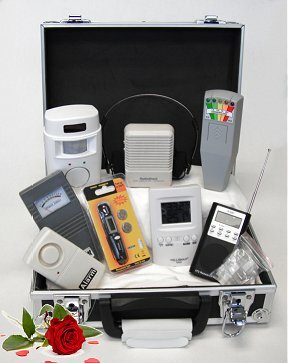 We realize that paranormal equipment can be purchased anywhere on the internet however in most cases it is defective, used, innaccurate or refurbished. All products at our store are brand new and do EXACTLY what they are meant to do which is seek out the paranormal with accurate scientific readings! We thank you for becoming a customer and look forward to doing future business with you! For the hobbyist Ghost Hunter. The Ultimate is what the professionals are using to hunt down the paranormal (Add your own camera and recording device). Deluxe Carrying Case to keep it all together. Looking to spice up an anniversary? Impress a date? Or add drama to your honeymoon? Imagine your partner’s delight when presented with the idea of a hair raising couples ghost hunt! Build trust and lasting memories when the two of you, alone in some spooky stakeout, look to each other for confirmation of your findings and reassurance! Imagine the topics you will have to discuss afterwards and the fun of telling your friends and family about your adventure. What you find could change the course of your life. Now that’s the opposite of boring! 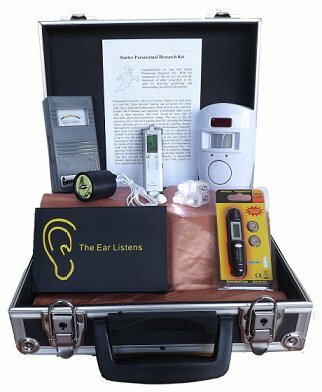 Goosebumps and curiosity go together when science meets the paranormal in this fun game with real, working environmental monitoring equipment. Make it as creepy, fun, spooky, or hilarious as desired depending on the location chosen for the party. Teaches critical thinking and careful record keeping, team building, leadership and cooperation. 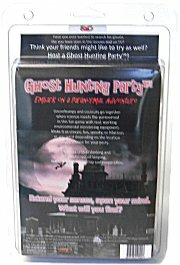 The Ghost Hunting Party has everything you need for up to 8 participants (age 12 and up) to have a wild time exploring paranormal phenomena! 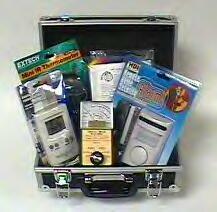 Equipment is designed to be easy to use with no prior technical knowledge required. Imagine your guests’ excitement when they find something unusually creepy and call everyone over to investigate! Note: We must add New York State sales tax to all shipments to an address within New York State. Actual tax rates vary by county (6.5% to 8.5%), but average at 8%. Sales tax collected from your customer will be retained by NYS. Money Order & Checks Accepted However If You Send One To Us Include An 8 Percent Sales Tax & On The Check Or Money Order Our Store #3338460 must be included. The Check or Money Order you send must contain on their these numbers 3338460 always so our wholesaler knows that the Paranormal & Ghost Society is processing your order and on separate paper you must include the Part# and the name of the product you are purchasing. If you are mailing a money order or check you must click order online that way it can calculate the cost of the product, tax, and shipping for you. Sending checks can delay the process 3 weeks longer to process your order keep this in mind so we do prefer Visa, Mastercard, Amex or Discover Cards. Please No COD's Accepted. We will accept returns on any item in new condition within 30 days of your purchase. We will make the exchange and/or adjust payments and commissions accordingly. Returned items after 30 days or which are damaged or missing parts (including packaging) may or may not be accepted and refunds may be prorated.